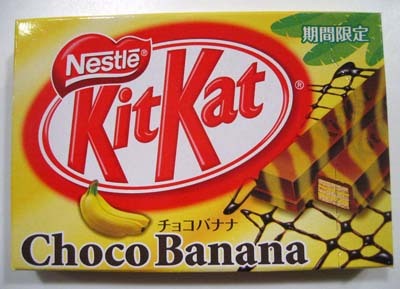 Banana Choco Kit Kat: When I opened it, I wasn’t sure what to expect in terms of appearance. The bar is milk chocolate with banana stripes and reminds me of a giraffe’s coloring with a zebra pattern. Smells of milky, sweet cocoa with a very faint banana smell. The taste really delivers and is much better than what I was expecting. Chocolate is definitely the dominant flavor, thankfully, because I’ve never been too big on banana. The banana is a light, sweet lingering aftertaste. Like the best friend that is always just behind, supporting you. The two flavors are in perfect harmony and work together so well. Banana really enhances the chocolate, yum! 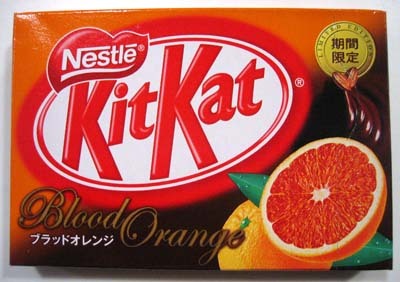 Blood Orange KitKat: Smells *exactly* of a Terry Chocolate Orange. Sweet milk chocolate with an orangey/hazelnutty aroma. The bar itself is very dark, so it must be a dark chocolate and the smell is totally playing tricks on me. The two fingers have a very clean snap to them. The chocolate is glossy and smooth. 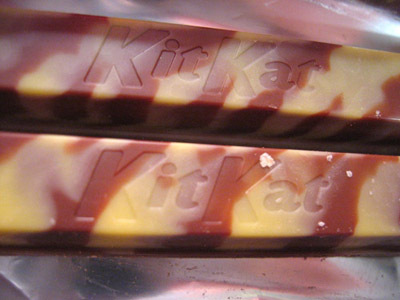 It’s by far the most attractive KitKat I’ve seen yet. The taste is made up of a sold bittersweet chocolate and it very tasty. It’s the perfect level of sweetness and the orange flavor comes in after the chocolate taste melts away. Again, I’m very strongly reminded of the Terry Chocolate orange. Fresh orange-y taste without being too overpowering or artificial. My favorite of the three, pick one of these up and you won’t be disappointed! 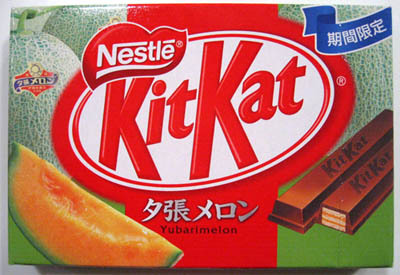 Yubari Melon KitKat: The smell is like a honeydew melon and I’m reminded of the cantaloupe Jelly Belly bean right away. The smell is fresh, cool, and fruity with almost a floral/strawberry scent to it. The color is a nice light brown milk chocolate. It tastes of a normal KitKat for the most part. The only time I taste melon is the first moment the bar hits my tongue where I get a honeydew-esque sweetness. It then fades into the sweet grainy milk chocolate that we all know and love. I enjoyed it a lot. It was a bit different, but still faithful to the original KitKat. Now, I’m not any more attached to KitKats than any of its competitor candies, but… ME WANT! there’s another kitkat variety i tried here in the Philippines im not sure if they really have it in other countries. It’s the cappuccino kitkat. Bought it from a 7-11 store also and the other from a grocery store. tastes like cafe mocha with the bitterness of cappuccino. really good. i like kitkats but they r nice but the kitkat chunkey is gross.